There’s a dark side to parenting, one that doesn’t appear on the cover of Child Magazine or in your rosy pre-baby fantasies of spending quiet evenings at home, cradling your pink, sweet-smelling newborn as you recline in Raphaelite beauty on your very expensive Babies ‘R’ Us glider rocker. And it can be summed up in one word. As in partially-digested, curdled breastmilk that Perfect Baby will spew all over your very expensive Babies ‘R’ Us glider rocker approximately 22 minutes after you get him home from the hospital, causing said rocker, despite multiple cleanings, to smell faintly of sour milk for the rest of its useful existence. As in the sudden, shocking stream of pee that spouts unexpectedly from your sleeping infant as you change his diaper in the middle of the night, necessitating a clean set of pajamas for each of you. As in the blood gushing from your six year-old’s mouth and head as she hurtles through the door from outside, screaming about falling off of her new bike and holding two teeth in her hand, temporarily sending you into cardiac arrest. Forget the formula coupons and Beatrix Potter blankets–they should send you home from the maternity ward with a mop. He brought it up last week. My husband, the guy who spends most of the daylight hours safely esconced in a nice, tidy office where everyone has assumed control over their own bowel and bladder functions. “Maybe we should start thinking about potty training Caleb,” he said. By “we”, I knew, he meant “you”. I heard someone whimpering and only realized after the conversation was over that it was me. Like a PTSD victim, I started flashing back through memories of the year and a half we spent in the campaign to potty train Katie. Some of them were not pretty. Most of them, actually. 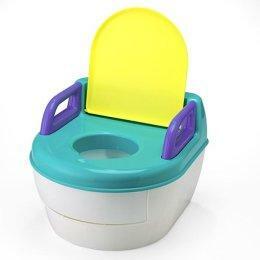 On Katie’s second birthday, we bought her a cute little training potty. Full of the starry-eyed optimism that only first-time parents can muster, we led her ceremoniously into the bathroom and introduced her to her new throne. First, Katie’s dolly sat on the potty. Then Katie sat on the potty with her diaper on. Then Katie sat on the potty with her diaper off. For forty-five minutes. While her Dad and I read to her from a stack of books with names like Everyone Poops and Once Upon a Potty. This scenario was repeated countless times in the weeks and months that followed, with the same results, as Paul and I grew more and more discouraged. Over time, Katie started devising other uses for what had become a sad little fixture of our home decor. She filled it with blocks and toys; she stood on it to reach my forbidden lipstick; she set up pretend tea parties on the lid; she hid food in it that she didn’t want to eat. Occasionally, she even sat on it, but only to visit with me whilst I was busy with my own sundry bathroom activities. At last, one day, she went pee-pee in the potty. Trumpets blew! Shouts of jubilation resounded! And she freaked out. When we were finally able to calm her down enough to piece together the reason for the tears, we realized that the, uh, “backsplash” caused by the miniscule potty had gotten on her, an unbearable torment. The cute little commode, erstwhile home to so many colorful Legos and tiny teacups, was abruptly disposed of, and we bought a potty seat that fit over the top of the big-people toilet. I won’t bore you with details of the on-again-off-again, hit-and-miss (mostly miss) attempts over the next few months to get Katie to start using the potty with regularity. Her third birthday came and went without success and we were running out of diaper sizes, starting to eyeball the Depends, when I realized that whoever came up with that comforting saying about how “no kid ever started kindergarten still in diapers” had never met our Katie. It was time for drastic measures. In the summer of 2002, we threw away our last dozen diapers like a nicotine addict tossing his last pack of cigs. We took Katie to Wal-mart and let her pick out her very own brand-new, big girl underpants. They were pink and white with sweet little flowers on them. They didn’t know what they were in for. Somehow we made it through, and I enjoyed six blissful months of diaper-free parenting before, in late winter, The Prince arrived on the scene. Is it really potty time already? You know, all the parenting books say to take your cues from your kids, watching them for signs that will tell you it’s time to begin potty training. Every boy or girl is different, and it’s important to wait until your child is truly ready. I think it’s only right that moms be given the same consideration. Good luck with that. 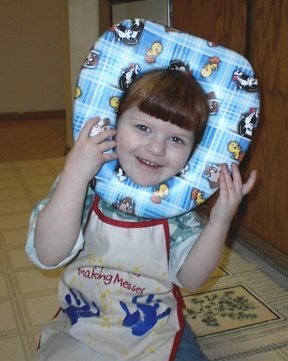 I remember potty training my first two was so easy – then the third one has been a nightmare. He’s six and I think we’re done. Maybe. 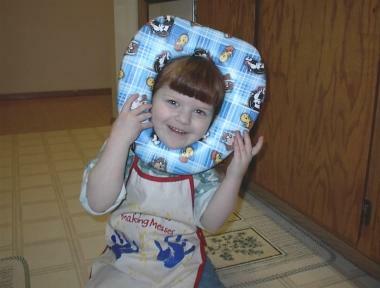 Well, my first started the potty-training thing at age 3. We had awful, horrible, very bad days of miss & miss again. I was religious in my endeavor to ‘teach’ my child how to be a big boy. Before leaving the house, we ALWAYS sat on the potty, usually with no deposits being made. He would always wait until the most in-opportune, very public moments to ‘relieve himself’ (i.e. the chair at the hair dresser, the grocery cart at the store, the booth at the restaurant we never go to anymore, etc.). It was awful! But, it took all of 1 day for a day care to have him fully trained!!! (I dropped him off for a day of errands, and left him with about 10 changes of clothes). The teacher simply sent him to the bathroom with all of the other potty-trained boys that showed him how a ‘big boy does it’ – standing! DUH, why didn’t I think of that?!? All that to say, boys are much more difficult than girls! Everything I heard & read told me to wait until the boy was at least 3 before beginning to potty train, so I did. He still wasn’t ready…until he decided he was ready! Ahh – already Jennifer’s little man is refusing to take suggestions from the women in his life. (sigh) What can I say but it brought tears to my eyes. The honesty with which it took to write such brave & truthful sentiments is one with which only you have the cajones to say. As a mother of two boys & one on the way, I can speak with the utmost certianity that you speak the truth my sister. And I wish they had a service to hire out people to teach potty training TO your child. This person would get up at 3am & remind them to potty. Sort of like a wet nurse only able to get messier. So said person would also have duties entailing washing out nasty clothes & accidents that didn’t even make it into clothes. Thanks for the warnings, seeing as I am due with baby numero uno march 7th. eeeeekkkkkkk!!!!!! Katrina – This blog had me rolling with laughter! If it makes you feel any better, I have a friend who’s convinced her child will still be in diapers at 16. And how such little people can have such pressure built up behind those fluids is a mystery! So much pressure from such little systems. Night Elves and Taurens and Gnomes, Oh My!